A retail pharmacy is located within the clinic, and is available to all patients as well as hospital staff. Services offered by highly trained and specialized pharmacy staff include individual medication counseling, free access to numerous adherence support tools, telephone follow-up, refill reminders, and home delivery of medications. The Clinic Pharmacy is open from 8:30 am to 4:00 pm, Monday through Friday. The phone number is 416-340-5207. Please allow 48 hours notice when calling for prescription refills. University Health Network is among Canada’s largest teaching hospitals. We’re a leader in training undergraduate and graduate medical students and residents, physicians, nurses and other health-care professionals. It is not only our objective to teach students of the health care professions, but also to provide ongoing continuing education to our staff and to provide relevant and useful health information for our patients. As such we are an organization with numerous educational mandates. In the course of your hospital appointment and/or stay, you can expect to be seen and examined by your staff physician as well as possibly one or more of the following individuals. Our team approach to education ensures that you receive the highest quality care from a dedicated group. The University Health Network is known for its world class excellence in research. Our research scientists and clinicians are studying many aspects of HIV infection, including experimental therapies for “boosting” or enhancing the immune system, or for preventing common infections and cancers. Ask your Clinic physician about our current research programs, and look for regular updates on research in website. 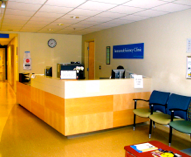 If admission to hospital becomes necessary, you will likely be admitted to one of our General Medicine floors at either the General or Western site, under the care of an attending physician. Your clinic physician and team will consult with this attending physician, and visit you on the floor during your admission, to deal with your concerns. If you need re-admission, we will do our best to ensure that you go to the same floor so that you can be cared for by the staff that you already know. If you have a concern, please direct it to a staff person you feel comfortable with. Alternatively, you can contact Toronto General Hospital’s Patient Relations Department at (416) 340-4907. Please help us to continue in providing the best outpatient HIV care. Language interpretation and counseling services in other languages are available. Please let us know in advance if you require these or other services. Maintaining your confidentiality is a critical concern to the clinic. Clinic staff will not leave identifying messages on your answering machine, nor will they mail correspondence to your home in identifying envelopes. However, please let us know if there are any special concerns you have with confidentiality and disclosure, so that we can respond appropriately. All our services in the Immunodeficiency Clinic are covered by OHIP. It remains important that you have and maintain the required OHIP coverage for yourself. The Immunodeficiency Clinic is not responsible for coverage (payment) of medications, although we will help you to get any and all coverage that you may be entitled to under social and community programs. Day treatment is available in the Clinic for patients who need intravenous medications, blood transfusions, fluid replacement, blood work, or various medical procedures.